On their very first album, Texan post-rockers Explosions in the Sky have a song entitled ‘Remember Me As A Time Of Day.’ It’s a quiet, contemplative five minutes that finishes the album off relatively pleasantly, and it seems, perhaps, as if blackened post-metal quartet Sólstafir have taken that concept and made one of 2014’s best albums out of it, Ótta. Each of the album’s eight songs takes its name from a traditional Icelandic method of categorising the times of day. This system broke the day up into eight sections known as ‘Eykt’. Each track name, as indicated in the track listing above, corresponds with a particular ‘Eykt’. ‘Lágnætti’ opens the album almost soporifically, with a soft piano intro and tender singing from vocalist Ađalbjörn Tryggvason. But, when the guitars and drums kick in, the song crescendoes, taking us away from the quiet, more domestic midnight of its beginnings and into the more raucous midnight one might find at a metal bar. Those softer moments are not forgotten however, and the pace soon slows again to allow the piano to come to the fore, reminding listeners that we are not experiencing one midnight or the other: we are experiencing midnight captured in musical form. The revels that might happen in one part of town are neatly contrasted with the quiet sleep of domesticity. The balance between louder and quieter moments is maintained into ‘Ótta’, with its catchy guitar motif perfectly evoking the intimate joy of wandering silent streets in the early hours of the morning. Musically, ‘Rismál’ takes listeners through a somewhat raucous dawn (perhaps Icelandic birds are louder in their dawn chorus than British birds) while ‘Dagmál’, ‘Miđdegi’, and ‘Nón’ lead us through the hustle and bustle of the day, while ‘Miđaftann’ allows the album to wind down into a quieter evening. ‘Nón’ is perhaps my favourite song after ‘Lagnaetti’, kicking into some seriously impressive guitars as the afternoon winds down and the evening’s revels begin. 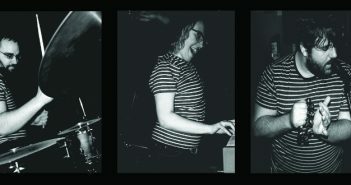 The album closes with its longest song ‘Náttmál’. In itself, ‘Náttmál’ could almost be taken as a microcosm of the album as a whole: it deftly mixes quieter moments with loud, and Tryggvason’s vocals are passionate, but never overwrought or overdone. Interestingly, if you were to take out the silence in the last few seconds of ‘Náttmál’, you could loop it back into the short crescendo at the beginning of ‘Lágnætti’, fully completing the album’s concept. 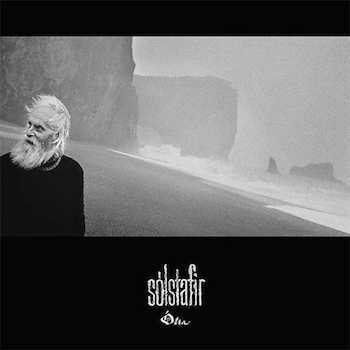 Unfortunately, I cannot really comment on the album’s lyrics, on the simple basis that I do not speak Icelandic, and there are only a few online translations of some of Sólstafir’s songs. In fact, the only translation I could find of a song from Ótta was of the titular song, which discusses betrayal and loss of faith. If that translation is anything to go by, the lyrics for the rest of the album are rather darker than one might expect from an album named after the times of day. Indeed, the dark lyrics of ‘Ótta’ may well hark back to the band’s earlier, more black metal releases, but outside of my own efforts with Google Translate, we will have to wait until someone who knows Icelandic can tell us what Tryggvason is singing about! Aside from an individual listener’s ability to understand them, the album could work just as well without lyrics. The music surrounding them is a gorgeous example of post-metal done right, perfectly conveying the times of day, whilst at the same time washing over listeners in a gorgeous soundscape that never feels messy, drawn-out, or pretentious. However, Tryggvason’s emotionally-charged delivery of the lyrics gives the album more passion, regardless of our understanding of them, and while the music is beautiful, the lyrics lift the album from simply being very good to the level of masterpiece. I do not use the term masterpiece lightly. 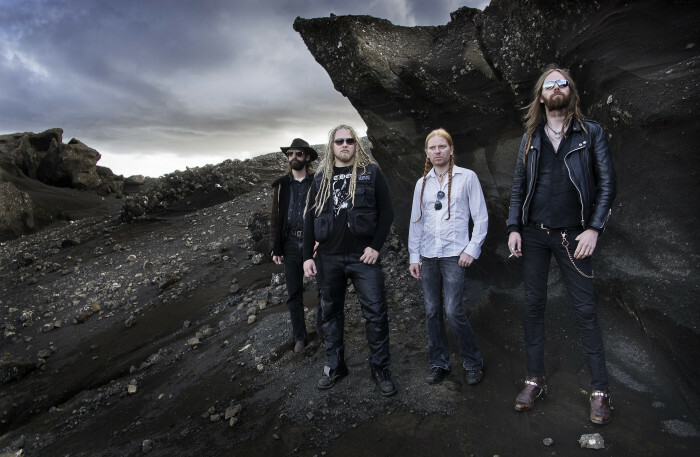 It builds on the lighter offerings of previous albums, particularly ‘Fjara’ from predecessor Svartir Sandar, showing that Sólstafir have evolved from their heavier, more black metal early days. It’s also a much tighter album than Svartir Sandar, which dragged in places, while Ótta keeps your attention throughout. Conceptually, Ótta truly captures the essence of a day, from the quieter beginnings at night through to the hustle and bustle of daytime. The balance of dynamics in the music reflects that no two people experience the same day: some people have turbulent days full of busy work and rushing about, some have quiet days interspersed with moments of joy, and so on. All of this is capped with Tryggvason’s passionate singing, which is pitched absolutely right to ensure it is not too overwrought. Truly, Ótta is Sólstafir’s masterpiece, and an absolute joy to listen to. 2. We’ve provided a deeper explanation of the ‘eyktir’ in the second tab at the top of the page. In order to give a better explanation of the Icelandic concept of ‘eyktir’, we reached out to an Icelandic-speaking friend who gave a rough interpretation of the times indicated by each song name. 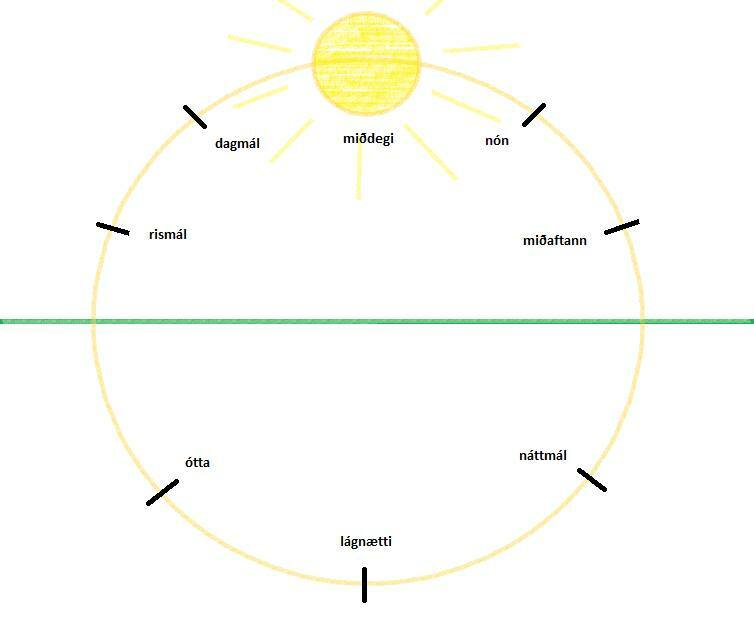 ‘Lágnætti’ marks the lowest point of the sun. ‘Ótta’ marks the start of sunrise. ‘Rismál’ marks the end of sunrise. ‘Dagmál’ marks the mid-point between the end of sunrise and the highest point of the sun. ‘Náttmál’ marks the end of sunset. She also provided a sketch diagram to better explain the positioning of the sun.